All Out Effort Blog: Do You Eat Like The Rock? Do You Eat Like The Rock? So you already know how to eat. You already know how to work out. You heard it over and over already. Avoid fats, eat whole grains, lean meats, etc. There's an article going around, and it's fantastic. I've always been a pro wrestling fan for whatever reason. Maybe when I first moved to the US, the first TV show I saw was Superstars Of Wrestling, on Saturday mornings. Then I saw how he worked out and what he ate. 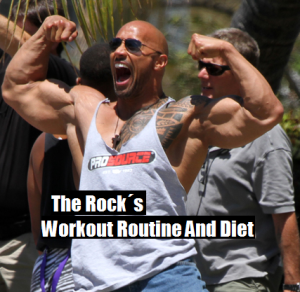 See The Rock Dwayne Johnson's work out and diet. It gives great insight and how hard the man works. He has one life, one career and he's making the most of it and truly I am a fan. But my article is not really about The Rock AKA Dwayne Johnson. Looking at this article, a lot of people eat and work out in a similar way, and they aren't trying to get as big as The Rock. When he first got into Hollywood, he actually lost weight to look better. Now he's gotten bigger than he ever was while wrestling and he's more popular than ever. Times have changed and tastes have changed. So why does looking at how he works out and eat remind me so much of people who are trying to lose weight, and not get as big as The Rock? Especially women? You eat 4-6 meals a day because you heard that's what your supposed to do, makes your metabolism go faster. So does The Rock. In fact when he's trying to get even bigger, he eats 7 meals a day. You think it's a good idea to work out 5-6 days a week, up to 2 hours. So does The Rock, along with boosting metabolism, you have to burn the calories right? You heard you're supposed to take protein shakes, eat skinless chicken breast, oatmeal, brown rice, cream of rice, egg whites, lean meats, etc. You know "healthy" stuff. So does The Rock. Actually between his bulking and cutting, his actual mass and weight will remain pretty constant, it's just his body fat will go down. According to the article, from 14% to 7%. Actually his work outs and his diet doesn't change much when hes building muscle or trying to lose fat. He adds an extra meal, and he does less cardio. So if your weight loss diet looks the same as someone's mass building diet, maybe we've been confusing weight gain and weight loss methods all along? I mean most everyone's ideas of diet did get trickled down from body builder's after all.